How to design a kitchen? With the kitchen being such a high activity area of the house it’s worth finding out how to design a kitchen – even if you’re using a kitchen designer or architect. Knowing what’s involved in the process will help you design your own kitchen or give a detailed brief to your designer. Kitchen renovation cost depends on the design of your kitchen. This page makes up part of the kitchen design layout series. Now usually I’m always encouraging my site visitors to think in terms of how you want a space to function before making interior design or furniture choices but for kitchens it helps to know where you plan to get your kitchen cabinets from. Most manufacturers have units in various standard sizes but always work with the kitchen cabinet dimensions that the manufacturer provides. Even if you’re getting a bespoke kitchen made, getting in touch with a maker and finding out if they work in any standard sizes (eg using whole pieces of wood to avoid cutting which reduces waste, need less labor and therefore cost a bit less). The second step of how to design a kitchen is to create a plan of your kitchen ‘space’ – the floor space and the wall space. First decide if you’re working in feet and inches or m, cm and mm. For example in the United States and Canada kitchens are designed and sold in inches, in the UK and Australia it’s millimetres. Take the lead from the main measurement that your cabinet manufacturer uses. Time to measure up! Take your time and be accurate and measure using the right measurement for your country. Measure floor dimensions, niches, windows, doors, where the water pipes (and gas supply if applicable) come up from the floor. Now it’s time to draw up the plan. If you stick to the paper option, it’s a good idea to adjust the scale so that you fit the kitchen onto a sheet of paper rather than the whole house. The scale you can use depends on how big your kitchen is and how big your paper is. Also take a look at the kitchen dimensions page that goes through some important kitchen planning guidelines. Using your paper drawing, online kitchen planner or software plan in the outline of where you will place the base cabinets, wall cabinets, islands and tables in your kitchen in plan view (looking down from above). Don’t worry about where the appliances and fixtures will be placed just yet. As well as the shapes above you could also consider incorporating curves in to the kitchen. This introduces challenges of being able to open adjacent cupboards and drawers at the same time without the doors or drawers banging into each other – but leaving a bit of space in between each set of units mitigates this. If you have a bigger room to work with one of the main things to decide is whether the kitchen will occupy the whole room with an eating area open to the kitchen, or whether you want to try and maintain a bit of privacy to the cooking area – make it a bit like a bar or a coffee shop counter. If you have an accident with dinner you might want to be able to put it right without everyone looking at you! Head on over to the kitchen triangle page. Head on over to the kitchen storage ideas and kitchen storage solutions pages. Storage is a big part of how to design a kitchen. You’re back? Phew – that’s kitchen storage done. At this stage you should have the wall plans filled out with all the fixtures you’re planning. At some stage I’ll be writing up a page on kitchen lighting design. 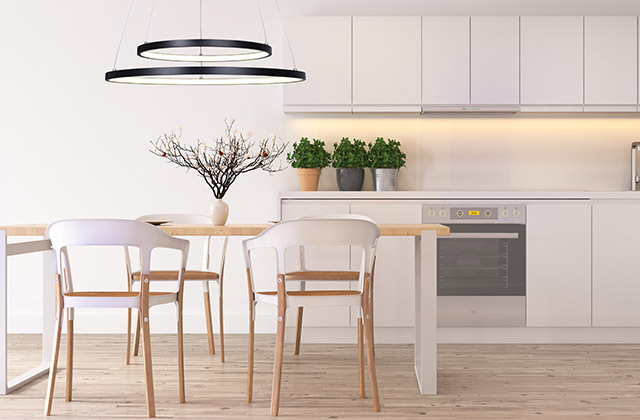 Your cabinet manufacturer may have some integrated lighting options. Plan the electrical points (outlets and switches for appliances) for your kitchen. There are several options for general outlets. If you have an appliance garage, a cupboard mounted microwave or want a TV in your kitchen think carefully about the best position for outlets. What other activities will happen in your kitchen apart from those related to food? How about a sitting area with a TV or games console? Office type activities such as computer time and paying the bills are also popular in kitchen spaces. Have a think about how your kitchen will relate to the spaces surrounding it. If it’s open plan to a dining space or living space what kind of view does the people in these areas get of the kitchen? How to design a kitchen? Click here on how to design your main living space.